The latest technology employed in the design of the Hercules RG-13 length grader assures a maximum efficiency when separating grain based on its length. The grain is fed into the rotating indented cylinders where the shorter or broken grain is lifted by the indented pocket into a conveyor trough that runs through the center of the cylinder and is discharged out at the end. 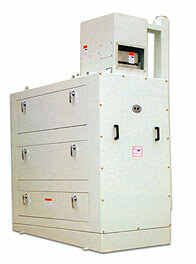 The longer grain that is not lifted is conveyed out along the bottom of the cylinder to the discharge outlet. This highly efficient and newly developed Hercules Model TG-612 grader is used to separate different types of grains and beans by their width and thickness. 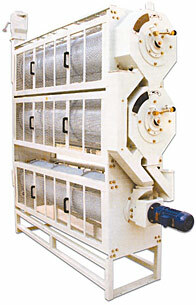 The separation process is obtained by running the product to be graded through the rotating perforated cylinders. The thinner grains will fall through the perforations of the cylinders while the larger, wider grain will continue forward. The rotating action presents the material in the most efficient manner to the close tolerance perforations to provide a precise separation. The Hercules Model RS-X7 Rotary Sifter uses the latest technology available to efficiently grade white rice and other products. This new generation sifting equipment can separate white rice accurately and efficiently into different sizes or separate small broken from rice bran. 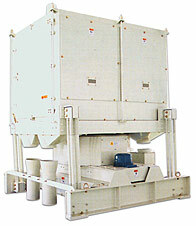 This precise circular oscillating sifter can also be used to separate beans, wheat and other products.